The EPE6 is a new version of one of Niobrara's most popular products. The EPE6 comes with two 100BaseT Ethernet ports and four serial ports. The serial ports of the EPE6 are RS-422/485. The EPE6 replaces all EPE5 models. An Ethernet media converter is needed to go from twisted-pair to other Ethernet media. * An Ethernet I/O scanner table with 128 entries. * The termination and bias of the serial ports is now configurable. * The backplane interface is now 16-bits wide. * Module information and configuration is available via web page or a front panel LCD. * Plug a PC into an EPE6 serial port and program Modicon and SY/MAX PLCs over the same connection. * The NR&D SC902 Smart Cable will connect an EPE6 serial port to a PC COM port. The EPE6 supports twisted pair Ethernet cabling with its RJ45 jack. 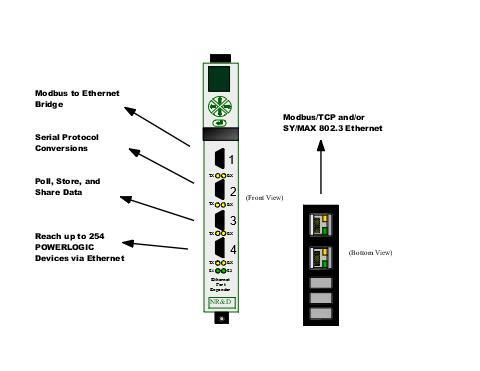 The Ethernet port can speak Modbus/TCP, SY/MAX 802.3, or both protocols simultaneously. The EPE6 supports BOOTP and DHCP for easy IP configuration. An Ethernet I/O scanner table supports 128 entries. The serial ports support 18 separate modes including all of the Square D and Modicon serial protocols. Each port can be independently configured. Some modes allow devices with different protocols to exist on the same physical media. Each serial port has an auto-scan table of 48 entries. The serial ports of the EPE6 support 4-wire RS-422 point-to-point or 2-wire or 4-wire RS-485 multidrop. An SC902 can be used with the EPE6 for an RS-232 connection. A DDC2I-5 converter with a DC1 cable can be used to provide an optically-isolated RS-232 connection. The EPE6 is in the form factor of a SY/MAX rack module. When used in a SY/MAX rack it has a register interface to the PLC but can also be used as a stand-alone solution by including a Niobrara NRK2 single slot rack (below). The configuration of the EPE6 is stored in registers available from any port. The configuration can be changed "on-the-fly" without rebooting the module. The configuration registers are stored in volatile RAM. For long-term module storage the configuration must be written to EEPROM "on-the-fly." Firmware upgrades are available free of charge. The EPE6 carries a one-year warranty. * SC902 RS-232<=>RS-422 Converter cable for configuring the EPE6 and upgrading its firmware. 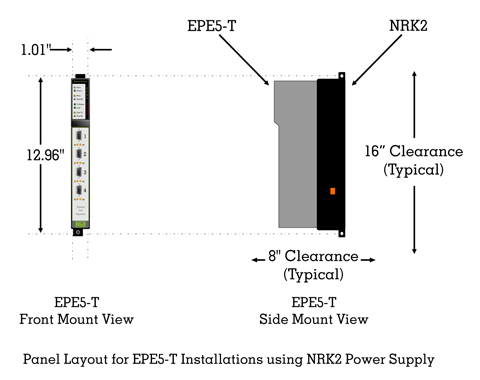 * NRK2 Single slot rack with built in power supply for stand alone installations. * DC1 RS-422 cable for connecting the EPE6 to a SY/MAX PLC or NIM. Dimensions: Standard SY/MAX register module. 1.5" wide by 13" tall by 6.5" deep. Approximately four pounds net. Rugged welded steel enclosure with baked on finish. All serial connectors and indicators are on the front, except the SY/MAX bus card edge connector is on the back and the Ethernet connector is on bottom. EPE6 Serial Ports SY/MAX compatible pin-out. Four RS-422/RS-485 serial ports. 50, 75, 110, 134.5, 150, 300, 600, 1200, 1800, 2400, 3600, 4800, 7200, 9600, 14,400 or 19,200 baud; 7 or 8 data bits; odd, even or no parity; 1 or 2 stop bits. Selectable checksum (BCC or CRC) supported in some modes. SY/MAX compatible DB9 female connectors with slide-lock posts. When used in RS-485 mode, ports are 2- and 4-wire compatible. Handshaking. Auto-scan and Auto-transfer enabled. Configurable Bias and Termination. Serial Port Modes: Each serial port can independently operate in any of the following modes: SY/MAX, Net-to-Net, Peripheral, PLogic, Multidrop, IDEC, Modbus Host (RTU - Master and Slave), Modbus Gate (RTU - master and slave), Modbus ASCII, Gateway, Transparent, Share, PNIM, RNIM Master, RNIM Slave, Transfer, Chevron, or Dual Slave. Ethernet Ports: 100BaseT (Twisted pair) with RJ45 connector. 128 entry I/O scanner. Ethernet Port Modes: SY/MAX 802.3, Modbus/TCP, or Modbus/TCP+SY/MAX. IP Configuration: BOOTP, DHCP, or configuration register writes. Mailbox Registers: 2048 processor equivalent registers addressed 1 through 2048. Any number of these may be rack addressed as needed for user applications. Any rack addressed register can be a PLC input or a PLC output as required by the application. Module Configuration: Module configuration is stored in registers in volatile RAM and can be changed "on the fly". For long-term storage, configuration should be stored to EEPROM "on the fly.". Indicators: Transmit and Receive LEDs for each serial port. Link/Activity LEDs for each Ethernet port. LCD for information/configuration. Operating Conditions: 0 to 50 degrees C operating temperature; -40 to 80 degrees C storage. Humidity up to 90% noncondensing. Pressure altitude -200 to +10,000 feet MSL. Buttons: 5-way buttons for information and configuration. Effective 30 June 2017 - Specifications subject to change without notice.